weeded out). Gradually, the X with the rogue gene was able to do less and less trading with its unaltered partner, and took on an identity of its own, as the Y chromosome. 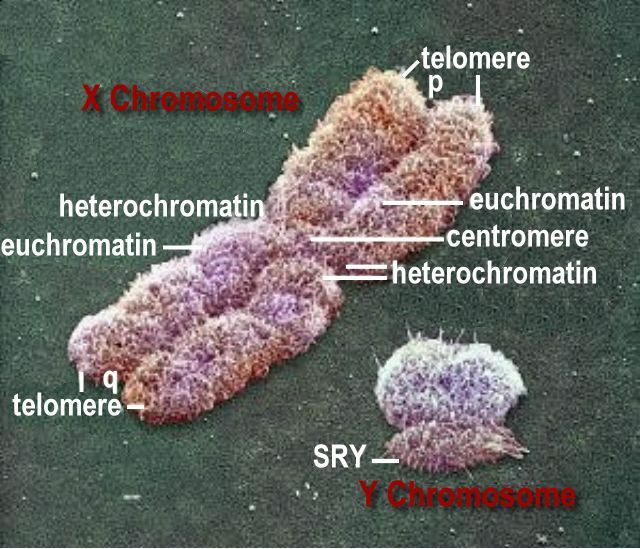 Thereafter, the carrier of two X chromosomes is developed into female, while the one with a X-Y pair becomes male (for some reasons the reverse is true for birds). In humans, the sexes look alike until the sixth week of prenatal development. All embryos contain two-sided, unspecialized gonads (organs that will become either testes or ovaries) and two sets of tubes. At the sixth week, one of two events occurs: cascades of a hormone (by the Y chromosome) steer development along a male route, or in the absence of this hormonal exposure, development continues along a female pathway (the default). The human Y chromosome has been sequenced in 2003, a summary of the new genetic information can be found in the special topic on "Y chromosome". 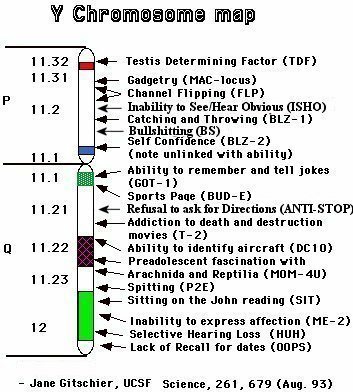 Long before the sequencing of the Y chromosome in 2003, geneticist Ms. Jane Gitshier of the University of California, San Francisco had already come up with her own map of the human Y chromosome as shown in Figure 11-34 (published in the August 1993 issue of Science). It purported to have located genes for such stereotypically male traits as flipping between TV channels, interest in the sports pages of newspapers and an inability to express affection over the phone - among others. The only thing wrong with the diagram is that these male behaviours come not from specific genes for each of them, but from the general masculinisation of the brain by hormones such as testosterone, which results in a tendency to behave this way in the modern environment. Boys are more competitive, more interested in machines, weapons and deeds. Girls are more interested in people, clothes and words. Thus, in a sense, many masculine habits are all the products of the SRY gene itself, which sets in train the series of events that lead to the masculinisation of the brain as well as the body. The evidence from zoology has always pointed that way: male behaviour is systematically different from female behaviour in most species and the difference has an innate component. The brain is an organ with innate gender.